It’s a rendition of verse 252 of the Dhammapada, translated by Juan Mascaró, and published by Penguin Books. It happens to be the first Buddhist scripture I ever encountered, and so it has a place of fondness in my heart, even though it’s not a particularly good translation on the whole. It’s easy to see the errors of others, but hard to see your own. You winnow like chaff the errors of others, but conceal your own —like a cheat, an unlucky throw. Easily seen is the fault of others, but one’s own fault is difficult to see. Like chaff one winnows another’s faults, but hides one’s own, even as a crafty fowler hides behind sham branches. In case you’re not familiar with winnowing, it’s the process of separating grains from their inedible husks. This is done by first drying the grain and then by tossing it in the air—preferably on a breezy day. The friction between the grains loosens the husk (or chaff). 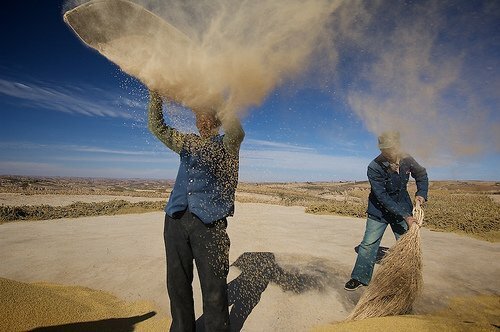 The wind then separates the heavier grain, which falls straight down, from the lighter chaff, which blows away. Thus, winnowing is a metaphor for metaphorically broadcasting information (“broadcasting” being another term borrowed from agriculture — it literally means spreading seed by hand over a wide area). We broadcast news of others’ faults, but try to conceal our own. Meaning that when you see faults in others you scatter [news of] them on the wind to all and sundry… But when you yourself perform even one misstep, you’re all over the place trying to cover for it by hook or by crook. If that’s the meaning (and I’m not saying it is or isn’t, since I’m not ready to enter into problems of the source-text), then couldn’t a better way be found to express it in English? Or would that violate the source-language’s wording too much? The English seems very straightforward to me, and your interpretation is correct. Is it the reference to winnowing that you think muddies the meaning?